"The way of the Master is not a journey – it has no beginning or ending. It is a process of living in each moment and of being all that you are." When you become the spiritual seeker your mind is full to overflowing with the need to know – to know all you can. There is a great curiosity to reach out and find the magic that is held in the heart of spirit. As you begin your journey you reach out to many teachers and many paths of knowledge and your mind becomes full of learning and understanding. You learn of the metaphysical world and become more knowledgeable. Your discover all that you did not know before. Yet has all of this truly helped you to become the Master of your life? Does it help you to change your old programs and habits of your lifetime (past and present) that cause you to live in limitation and separation? 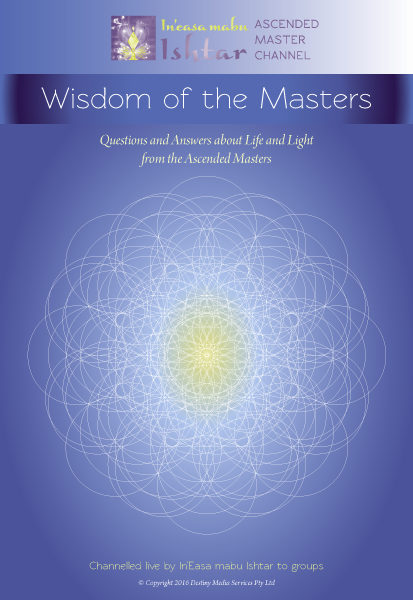 If you feel you have learnt so much on your journey but still do not have mastery or power in your life, then please come and join Ascended Master channel In’Easa mabu Ishtar who will share with you the secrets of the Ascended Masters so you can begin to walk the path of a Master and open to self-mastery in your own life. Ishtar has spent more than 13 years training and working with the Ascended Masters and sharing their wisdom with students from all over the world. This wisdom has helped to change the lives of many people from limitation to great potential. During this one-day workshop Ishtar will channel the Ascended Masters who will share with you why the return to the Earth again and again to support humanity to be all that they can be. The Masters will share with you why your are here on the Earth and what you have really come to learn. Ishtar will offer to you teachings and keys that you may implement in your life each day to assist you to be a Master and to take back control of your life. Ishtar will show you how to live consciously each day and walk in the footsteps of the Ascended Masters so that you may truly find peace and harmony in your life.